Cheetah robot has set a new world speed record for legged robots, running faster than Usain Bolt, who is considered the fastest human. The headless machine, funded by the Pentagon, reached 28.3 mph (45.5 km/h) when tested on a treadmill. Jamaican sprinter Usain Bolt’s top speed is 27.78 mph (44.7 km/h). The project is part of efforts to develop robots for military use. One robotics expert said that it was “unfortunate” the Cheetah was made primarily “to kill people”. It has been created by the Massachusetts robotics company Boston Dynamics and backed by the US Defense Advanced Research Projects Agency (DARPA). According to DARPA, the aim is to “more effectively assist war fighters across a greater range of missions”. The Cheetah, which is powered by a hydraulic pump, broke its own record of 18 mph (29 km/h), recorded in February. 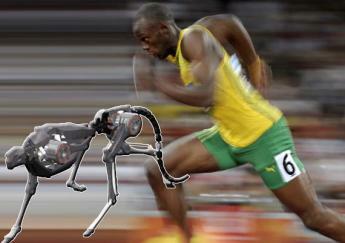 “The Cheetah had a slight advantage over Bolt as it ran on a treadmill, but most of the power Cheetah used was to swing and lift its legs fast enough, not to propel itself forward,” DARPA said in a statement. The agency plans to test the robot in the field in 2013. The machine’s design has been inspired by the real cheetah, the fastest land animal, which can reach speeds of 75 mph (121 km/h). “Cheetahs happen to be beautiful examples of how natural engineering has created speed and agility across rough terrain,” said Gill Pratt, DARPA programme manager. Noel Sharkey, professor of artificial intelligence and robotics at the University of Sheffield, has mixed feelings about the development. “It’s an incredible technical achievement, but it’s unfortunate that it’s going to be used to kill people,” he suggested. “It’s going to be used for chasing people across the desert, I would imagine. I can’t think of many civilian applications – maybe for hunting, or farming, for rounding up sheep. DARPA’s press release for the Cheetah project suggested that the robots might ultimately be used in “emergency response, humanitarian assistance and other defence missions”.